From time to time I'll put some of the quick translation work that I'm doing on the blog's FB page. These are usually snippets of articles/books or quick Q&A sections from Petit Journal du Brasseur. I feel that these posts don't warrant their own full blog post (at least not at this stage), but I still find them interesting so I want to share them somewhere. The downside of doing this on FB is that they are quickly lost and tricky to retrieve. So I've decided to catalog them here in this blog post so that anyone (myself included) can easily find them and look back at them. A question about brewing a beer for aging (PJB 1910). In addition, I thought I should add something new, so here's a new snippet of something quick - the sort of thing that I'd usually put on the FB page. 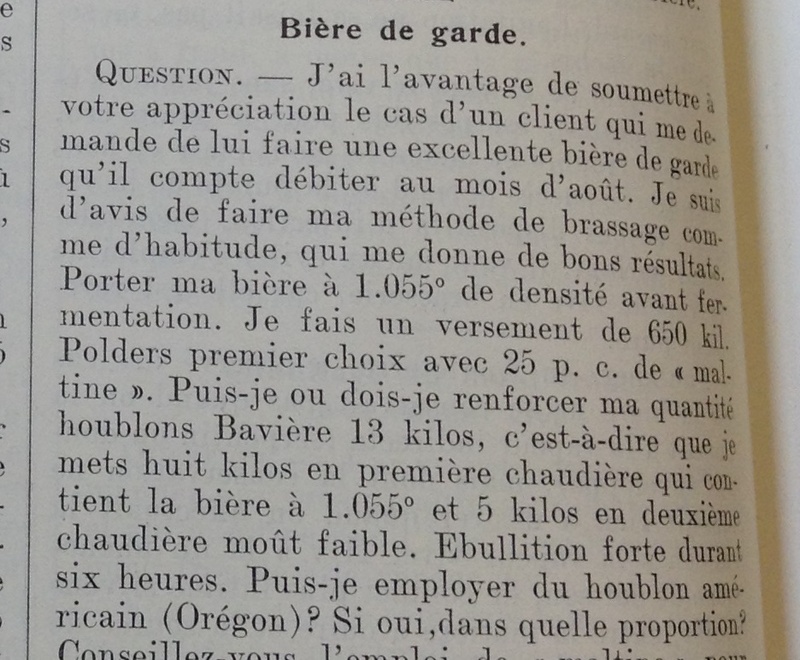 This comes from Petit Journal du Brasseur in 1910, where a brewer is asking about brewing a bière de garde with an OG of 1.055 for serving in summer (note that bière de garde is used here as a general term for an aged beer, not for the French category Bière de Garde). The advice follows general advice for this sort of beer for the time (for example, suggesting 100% barley malt, though as the gravity is above 1.050 perhaps some unmalted grain could be used) but with some good insight. I think the discussion of hopping is a good section to highlight here as there are a couple important points. First, they note hopping rates need to be sufficiently high for the beer and suggest at least 20 kg for 812 kg of grain. This hopping rate is pretty high (on the order of 50% higher than lambic at some modern breweries). Unfortunately the batch size isn't given, but making efficiency assumptions based on other beers of the time, this is probably roughly a hopping rate of 500 g/HL (an earlier version mistakenly said 500g/L, see the hopping table in this post for notes on conversion factors here). This highlights the importance that brewers of the time placed on hopping beers for aging at elevated rates. Second, there is discussion of using hops of multiple years. So potentially a brewer could be using aged hops in their beer, but the volume of aged hops suggested would be roughly doubled to replace a portion of hops from the most recent harvest. I like the information here regarding aged hops v. fresh for hopping rates as well as the context that the information gives - brewers may or may not be using aged hops for beers destined for aging that weren't lambic. Finally, the post discusses the possibility of using hops from Oregon. The use of US hops shows up elsewhere at this time in Belgium but I don't think I've talked about it before. So this is a good time to point out that US hops were used by some brewers in Belgium in the early 1900s. Mention of hopping rates, age and origin (PJB 1910). Here is a compiled list of posts from the blog's FB page. This is organized by topic, with the original source and posting date, and any other notes. I'll try to remember to update it as I post more on the FB page. Lambic-like beer called "Vieille Bière" - PJB 1897 (posted 1-Feb-2018). Mention of an old beer similar to (or the same as) lambic, and also called "non-fermented" by the journal. Faro, Bière de Mars and Lambic - PJB 1937 (posted 4-Dec-2017). Distinction between faro (blended lambic and bière de mars) and sweetened lambic. Faro - PJB 1924 (posted 16-Oct-2017). Regarding Brussels without Faro. Faro, Bière de Mars - PJB 1933 (posted 4-Oct-2017). Faro production and general comments on popularity. Lambic advertisement - PJB 1908 (posted 15-June-2017). Advertisement for a brewing clarifier. Lambic - PJB 1909 (posted 10-Mar-2017). Discussion of hopping lambic. There is also a full blog post on this topic here. bière de garde - PJB 1908 (posted 6-Dec-2017) . Recipe and process info for bière de garde. bière de garde - PJB 1902 (posted 31-Oct-2017). A brewer trying to make a quick bière de garde. bière de garde - PJB 1900 (posted 18-Apr-2016). Discussion of aged beers v sour beers made by quick blends. Full text in the comments. bière de garde - PJB 1904 (posted 16-Apr-2016). Discussion of hops (the brewer's bière de garde was not acidic enough). Hop Hierarchy (dry hopping) - PJB 1902, 1907 and 1910 (posted 23-Apr-18). A compilation of PJB articles mentioning hop preferences and usage rates for dry hopping. English hops are generally preferred. Hop Hierarchy - PJB 1902, 1904, 1907, 1909, 1912 (posted 26-Mar-18). A compilation of different articles with discussion of which hops (Belgian, Czech, German) are preferred for different beers/different purposes. Grisette - Les Memoires de Jef Lambic (posted 9-May-2017). Just a brief mention. Diest - Lacambre, 1851 (posted 9-May-2017). In the comments of the Jef Lambic post. Brettanomyces in top fermentation beers - PJB 1920 (posted 17-Oct-2016). White Beers of Northern France - PJB 1910 (posted 20-July-2016). Note that there is a full blog post as well on this topic here. Comically blunt responses - PJB 1902 and 1911 (posted 17-Apr-2016). PJB being blunt in replies. Grisette - Van Baalen 1829 (posted 18-Jan-2016). Brief mention of grisette.